With a thriving economy, an exceptionally low crime rate and Silicon Valley just down the freeway, Foster City, California is an excellent place to consider for one’s next trip or place to call home. Founded in the 1960s as a planned community, Foster City has a population of just over 30,000 people on just fewer than 20 square miles and was incorporated in 1971. Located on the east side of San Mateo, the climate is mild with July averaging 80 degrees and December averaging 38 degrees Fahrenheit. The city provides water and sewer service through its public utilities, and the Foster City Police Department helps keep the crime rate to less than one violent crime per thousand people—one of the lowest rates in California. In fact, Safewise.com rated Foster City #9 on its list of the 50 safest cities in the state in 2015. The appeal of Foster City isn’t just about the low crime rate. Its schools are known for turning in excellent API test scores, and all three elementary schools consistently score over 900 on the API index. Bowditch Middle School also regularly scores over 900 on the index. 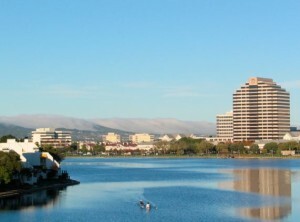 There is no shortage of employers in Foster City either; Visa is the largest employer with over 2,400 employees, while high-tech companies like Gilead Sciences and Sony Computer Entertainment’s Foster City Studio have a strong presence as well. When it’s time to leave work, residents can enjoy over 160 acres of parks and open space. In total, Foster City has 24 parks that have basketball courts, soccer fields, bike paths, softball fields and barbecue areas. The city also has its own five-mile-long lagoon that weaves through the downtown are. No powerboats are allowed, so the water and the quiet can be enjoyed. 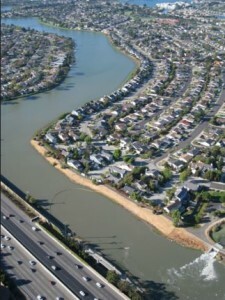 In total, Foster City has over 200 acres of waterways throughout the city, and swimming is strongly encouraged. Fishing is also allowed with a license. Have a pet that likes being outside? Dogs have been planned for, with large dog parks for both big and small dogs (fenced off from each other for safety), a grassy area, and an area with play apparatus. If you’re more into the arts and culture scene the Foster City Art Gallery is open six days a week. The Hillbarn Theatre is the sixth oldest operating amateur theater company in the entire nation. The Polynesian Festival one of the city’s main spectacles. Complete with Hawaiian dancers, Tahitian and Cook Island drum dances, and the traditional Samoan Siva occurs each May. The Arts and Wine Festival in June has over 150 booths featuring food, microbreweries, and crafts. For a combination of relaxed suburban living, safe streets, and excellent schools, Foster City is worth a serious look. Foster City is much smaller in size and population compared to San Mateo and Redwood City. What Foster City lacks in size it makes up for in liveliness. The city was literally built around making physical activities readily available to anyone who spends time there. The city is one of San Mateo County’s best-kept secrets. Don’t hesitate to let me know your thoughts or questions. Contact Me Here and I will be sure to help you with anything you need.